On arrival brightly coloured birds greeted us. They flew from the pressing woodland to the gutters, to the garden table and to the fresh leaved trees that hung over the cottage door. They perched in hopeful anticipation of food, leaning forward, looking down at us, checking us out. Red and green birds. Red and blue birds. Metallic blue-black birds. Beautiful birds. Against a briefly blue sky, a Blackbird sang its spring song, an invitation to some, to others a warning of possession. Its beak flared golden as the wind sheparded grey clouds across the sky. Once the clouds were gathered in, a storm would begin. Inside the cottage there were clear instructions not to feed the birds. The King Parrots stayed most of the week. 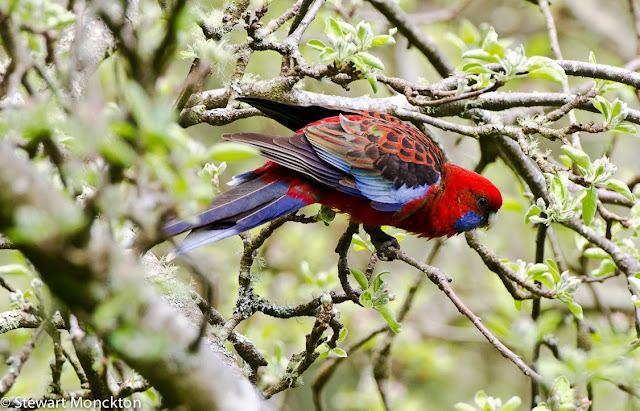 The Crimson Rosellas visited most days, but never stayed long. The Satin Bowerbirds fled the garden within minutes and never returned. The cottage is chilly, it smells empty and temporarily unloved. The fire is disappointingly unset. Soon flames pass from paper to twig, from twig to stick and from stick to split log. The firebox ticks as it expands, the room grows lighter with the warmth. 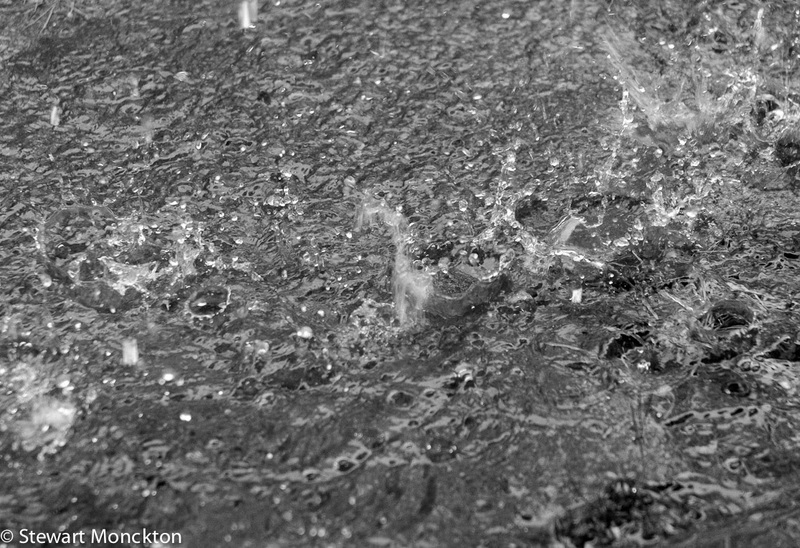 The rain begins to fall in fat heavy drops that splash against the windows like gravel. In the clockwork firebox, the logs settle into the embers as the kids settle into the long sofas. It keeps on raining. Despite the lure of the feathered welcome party it remains an indoor day, a slow day, a reading day. And, if the truth were told, nobody seems to mind. Storm rain falls all night, a soft, insistent hiss on the tin roof. A jazz backbeat – unpredictable, but frequent – of gum nuts crack onto the roof as well, sharp and loud above the rain. Louder noises could be twigs and sticks; the noises speak of a morning harvest of kindling for the fire. I awake to the sea-sound of wind in the branches; the pompom bunches of leaves in the gum trees thrash in the storm. It’s still raining. The kids are not up yet, oblivious to the noises above they are sleeping long in the warmth that has spread through the cottage. Kookaburras hunt on the lawn outside the bedroom window – short, sharp dives from the cover of dripping branches. I hear the creaking gate call of Gang Gang Cockatoos, the distant calls of Yellow Tailed Blacks. Currawongs call and bounce on long wings. Directly across from the window, a painting on the wall seems to speak of the passing of a child, or maybe of childhood. My kids arrive, warm and still sleepy. “Magic and Loss”. Storm debris and a few gentle breaths lift a fire from the embers – for the rest of the week the fire never looks like going out. Toast pops, the kettle clicks off. Cups rattle from their boards. Knives scrape with a sandpaper rustle over toast. I love this time of day, this time of the holiday. Once I would have rushed outside, peace (or some counterfeit of it) only being possible in motion. Success and relaxation found in activity rather than stillness. I am still driven to do “things” – but on mornings like this, the stillness of an extra cup of tea and the sound of the rain is thing enough. Eventually it dawns on me that it has stopped raining. 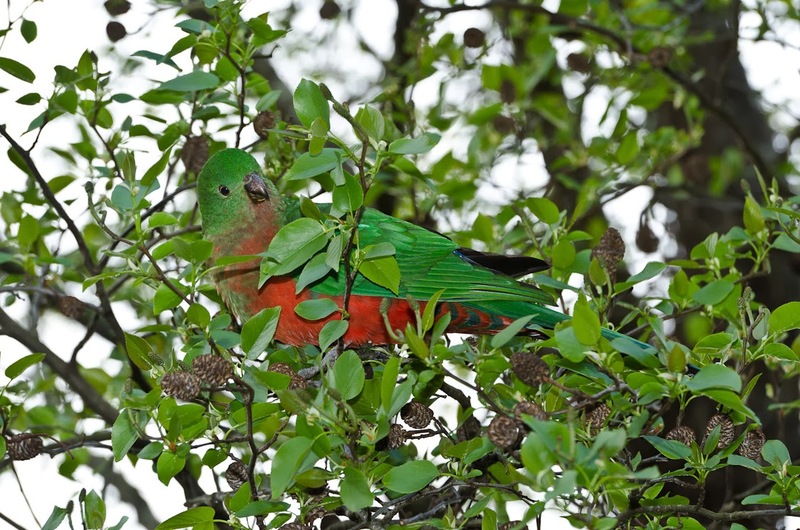 King Parrots call. They wait, ever hopeful, on the wooden table just outside the door. It’s clear that they have not read the house rules. The trees still thrash, but the air is crystal clear, washed clean of dust. There is a hint of eucalyptus in the air, maybe released by the banging of the leaves against each other and their supporting woodwork. Miniature cones from an alder roll and crunch underfoot, the grass around the garden is soaking wet, each blade tipped with a silver drop. We explore with feet that become damper with each footstep – in the long grass you may as well have walked though water. Down below the house two rows of fruit trees – an orchard according to the “Do not feed the birds” booklet – sit in rosettes of forget-me-nots. At ground level you could be in England. As your view grows higher you take in the base of the tree, then the branches speckled with flowers – still England. It’s only when the view opens to the gum trees beyond the grass that the view becomes truly Australian. The combination of plants (and the rain!) makes me feel at home, stretched across both of the worlds that hold that name. The row of fruit trees leads to a fenced garden; a low fence for rabbits and high one for kangaroos. I doubt either act as a barrier to slugs and snails. A fine stand of broad beans and banks of herbs fill the garden beds. The wind sends showers of petals through the fence; some stick to the wires fluttering like parade flags, most fall onto the wet ground. A different movement catches my eye as a bird zips from the beans to a plant with pale pink flowers. Few birds that I know of are as distinctive as Eastern Spinebills – a long curved bill, a white chest flanked by curved dark lines that flow down from the head. Within the white field of the rest of the chest a chestnut brown patch creeps up towards the neck. The bottom of the chest and the underbelly are chestnut too. Their eyes are bright red. Field marks abound. But beyond the convenience of identification there is also a wonderful beauty in this bird. It hangs in all kinds of ways and even hovers to drink the nectar of the flowers. Its sugar charged activity drives it from flower to flower – a tongue full here, a sip there and then a longer pause for a longer drink. It reminds me of something I have never seen – a humming bird. Down past the garden, over a crackle snap carpet of fallen twigs and branches is a small dam. I know it’s a dam because I’m in Australia, but it still looks like a pond to me. A slippery wooden jetty sticks out from the back, and a small wooden boat lies upturned on the bank. We find the oars and the kids set sail on a voyage of discovery, spinning in circles and turning round in 37-point turns. Floating leaves are pushed under the surface with the oars, only to pop back up a few seconds later. The path cleared by the boat closes behind it as it heads, zig-zagging, to the slightly distant end of the water. A duck, annoyed at the disruption, takes flight. I wonder if there are fish silver skimming between the roots of the plants. As a kid I would have expected tench to dwell in the wood green water. A red topped float on a June morning, a scattering of bait and (when all went well) the slow, but heavy pull of a hooked fish. Despite my best efforts, I see no such things here. H gets out of the boat and P takes up the oars. She laughs as she spins. I still think there should be tench. We drive down a winding road, past trees that show signs of the passing storms, to Lorne, a seaside town that swells beyond its capacity in mid-summer and slims to a more comfortable level the rest of year. Long sweeps of beach sand. A walkable pier with a fish and chip shop that likes to think of itself as a restaurant. Safe, predictable waves, and a scattering of silver gulls. Even in the rain it’s a long way from the hardscrabble enjoyment offered by the beaches of the North Sea or the Bristol Channel. Spring in Victoria brings days of winter and days of summer; you wear a hat and take a coat. You may need an ice cream, but it could be a hot chocolate. It’s best to laugh at the weather, because in the gloom of the late afternoon storms, some people look fit to cry. The kids run around and sometimes through puddles. They run up the walls of a skate park – skating without wheels or a board. They flow up and down the steep sections like yoyos. Storms chase clear blue from the sky; rain runs from the rays of the sun; rainbows arc over the pier. The pot of gold is behind the breaking waves, clearly in sight, just out of reach. On the beach things are secret and concealed. Blown sand slides down the wind, stinging bare ankles, blurring the edges of everything. A football star hides behind dark glasses. Leaves become buried where they lie. Dogs chase the ever-present and much neglected silver gulls, their splash tracks washed away by the waves. You walk up the beach and back again and nature has removed the evidence of your passing. Even journeys on familiar sand become new. It’s the endless possibility that keeps you walking towards ill-defined points on the horizon. One place would be as good as any other, but I still mark a spot – draw a mental line in the sand – where I turn around and head back. A new beach in each direction. 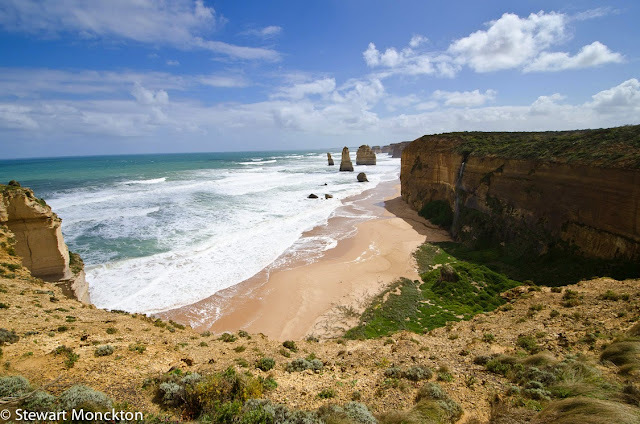 The movement of sand and water are key to all coastlines – erosion takes it away and deposition gives it back. Take a little, give a little. The solidity of land pitched against the endless energy of the sea. Storms will capture the headlines, but every day the land is battered, broken and dissolved by the sea. The coastline changes, but we don’t notice until it falls down. An hour along another winding road the power of the sea to carve the land is on display. Around Port Campbell a raft of rock towers, arches and bridges have been cut into soft rock. Here the rate of change is almost visible to the naked eye, and from time to time things fall down. 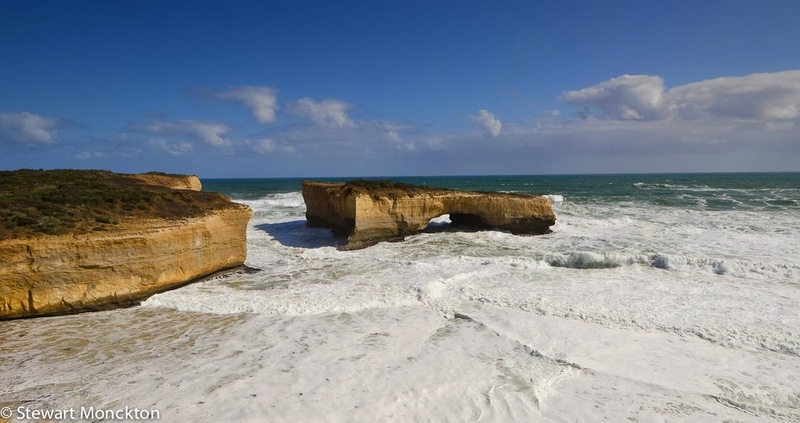 The famous features are named from another time; London Bridge, part of which, listening to the song, has fallen down; The 12 Apostles, which number less than the nominal dozen and are as bound to the laws of the Earth as the rest of us. The coast is on the left, the car park to the right. The visitor’s centre is hidden from view behind a slight rise. If people really do need to have access to coffee and soft bread sandwiches everywhere they go this seems about as good a way to provide it as I have seen. I don’t really know if the decision to place the amenities out of view’s way was done on aesthetic grounds or because of the realisation that having them close to the coast would erode confidence in its long-term survival. Trucks rumble over the underpass. Kids – not just mine – try to make their voices echo. Welcome swallows wingtip their way past families. Traffic flows in four directions. Well-made paths lead to well known viewpoints; classic views, calendar views. Couples swap cameras and take photographs of each other with the Apostles in the background, some ask other people to help. Peace signs, cheesy grins, the ritual of travel proof for people back at home and for people only connected through the ether. I take almost the same shots. I start to look for other shots as well. Small waterfalls tumble over the cliff edge, last night’s rain going back to its second home – a flow that connects the sky to the sea. Waves pound with a ceaseless energy at the base of the Apostles, cutting them down to size a grain at a time. There may have never been 12 of these rock pillars, their name just an invention. But the waves that knock them down are cutting new ones elsewhere, so the number is never really fixed. The sea, like truth, is not limited by the inventions of man, we build things up and the sea brings them down. We build things up, mindscapes, until the truth of nature brings them down. But just like the name of these sea stacks, some things linger on beyond the obvious truth – autumn leaves still branch fast in winter storms. Nature and process. Truth and lies. The inner view and the outer scene. The sea, the waves and the slow falling of stone bring such thoughts to mind. As ever, the journey back seems shorter than the journey there. The road winds in a now familiar way. The fallen branches have been broken under passing wheels. On the dam the floating plants are all back in place. At the door we are once more greeted by Kings, but the Crimsons are elsewhere. Stewart, not much on the Internet invites me to read at length, but once again I have spent 10 minutes lost in your wonderful prose! PS - on Sunday my son had did indeed have an ice-cream and a hot chocolate on the same day! Stewart, your bird photos here are absolutely stunning. Stewart, you really bring it all so beautifully to life. I do so love that stretch of coast. 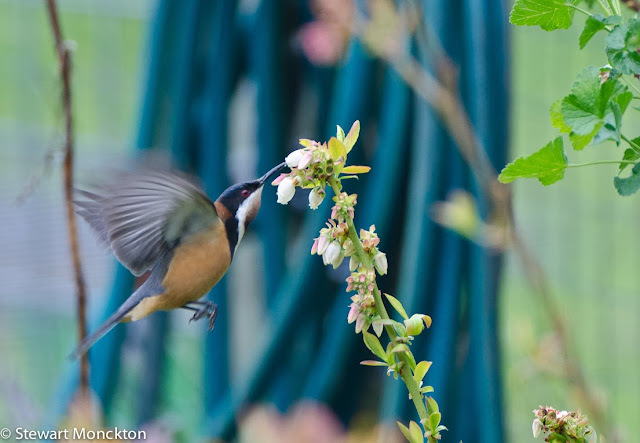 A real treat to see the Eastern Spinebills and am glad I have found another space for a blueberry bush since it looks like that could attract them. They also love native fuchsia. I've always had them in our Mt.Lofty garden but have not yet managed to attract any to the farm. You certainly found a well situated cottage in Lorne for your stay, complete with garden and so many birds. I may never make it to Australia, but I will have experienced it through your words and pictures. What a joy this trip had to be and it inspired the philosophical thoughts that bring us all back to nature. Some will never admit that nature rules and that man can't contain it, but they will learn, over time. Beautiful piece, Stewart. I sometimes forget what a talented writer you are, but you bring it all home in pieces like this. I am waiting for the day that you publish ... then I can keep your words and refer to them as I wish. Your photos of birds are fantastic. Stewart, you are wonderful writer. Wonderful stuff as ever Stewart - hard to tell which is better - the pictures or the prose!! Wow - what a gorgeous post. Stunning shots and poetic words. Wonderfully written and illustrated! Thanks for carrying me away! Oooops! Reality hits! Time for a doctor's appointment. Got to run! I've just been lost in your words and pictures for 15 minutes or so; time well spent. My goodness Stewart,these birds are gorgeous! I'll be back to read this in detail at the weekend. Those birds are gorgeous! I love their vibrant colors. Truly stunning photos and blog post- is that a 21st century schizoid bird talking to the wind? Hi Stewart. Such beautiful photos and text. I thoroughly enjoyed it. What colours! Amazing photographs. I really liked the colors of the birds. Thank you for sharing. Their beautiful feathers brightened up my day. You have such gorgeous birds DownUnder! Great variety in this post! 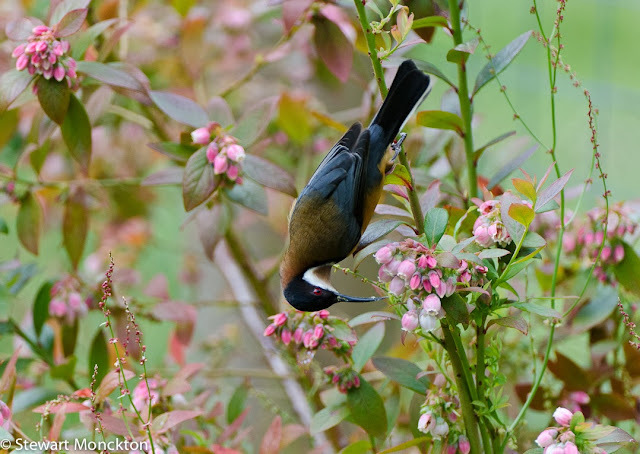 The Spinebill is quite an acrobat! Beautiful rainbow shot! I am now humming "In the Court of The Crimson King" Might just have to pull out the old vinyl! Amazing pictures Stewart!! !So beautiful and colorful birds! !I like the rainboy shot!!!Excellent!!! Hi.. Beautiful pictures.. Well done.. Cheers!! !..